According to the Brazilian legend, Mboitata (Tupi-guarani, "mboi" - fire, "tata" - snake) is a giant serpent that survived the great flood by hiding in a cave. It is blind during the day, but at night, when its eyes light on fire, it crawls out of the cave to hunt. This composition is a result of extensive research of the Brazilian music and mythology. It combines the elements of pentatonicism, typical of the music of indigenous people of Brazil with the Afro-Brazilian rhythms, and uses the feature of the religious practice of Candomble, where a specific rhythm is assigned to invoke a particular entity. 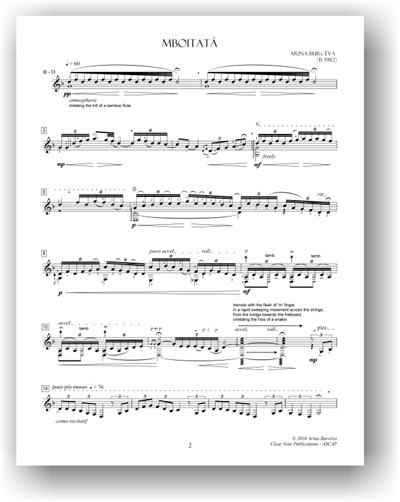 The piece opens with a colorful improvisation in pentatonic mode, which features scarcely placed open harmonies, percussive tones and subtle trills, invoking the exotic atmosphere of the Amazonia. 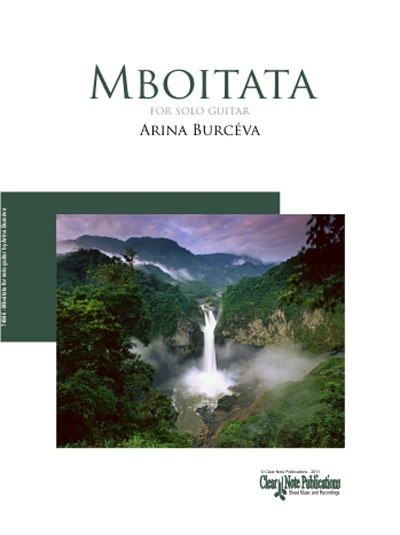 Following it motif in pizzicato, inspired by the Native-Brazilian chant, ends abruptly by a percussive, syncopated figure, put to the syllables "Mboita- ta". It gradually becomes more elaborate and transitions into a fast rhythmic section of variations, taking the player and the listeners on an exciting musical adventure through the intricate forest of sounds, rhythms and modulations, culminating in the mysterious reappearance of Mboitata. Excellent service; very quick and well packed.